It has come to my attention that inconsequential TV funnyman Stephen Colbert made the following pronouncement on his little-watched basic cable "news" show. "They [homosexuals] have already claimed mustaches and short-shorts, they've ruined those for the rest of us." "A statistical correlation [between mustaches and homosexuality], it's not cause and effect. Mustaches don't make you gay, but they don't help." This is the sort of ill-considered tripe that flows from the follicularly impaired, Mr. Colbert. Gay or straight, any mustached man is more masculine than a barelipped buffoon such as you! Jingoism: The last refuge of the clean-shaven scoundrel! Mustache or no . . . the man is an American hero who stands for truthiness and America (well . . . according to him, he is America, and so can we). 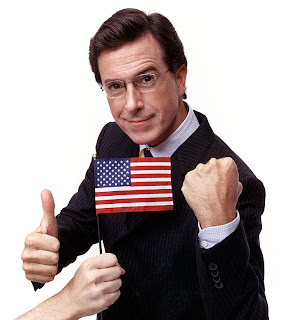 Just maybe this patriot could give a Colbert bump to the mustache! What? He is a mustachophile, but a homophobe. He is a man upset that mustaches have been incorporated into the homosexualist agenda. Hate the sinner, love the stache: that is his motto. Do you not have the brains to realize he is nothing more then a man who satires what mainstream idiots think?